This is Randi Hacker from the KU Center for East Asian Studies with another Postcard from Abroad from the Kansas African Studies Center. Yes, it DOES snow here in Africa! Although we often think of African countries as hot, desert environments, some countries in Africa receive regular snowfall. While some equatorial African countries do have warm weather, things are different at higher elevations and farther from the equator. The peaks of the two tallest mountains in Africa, Mt. 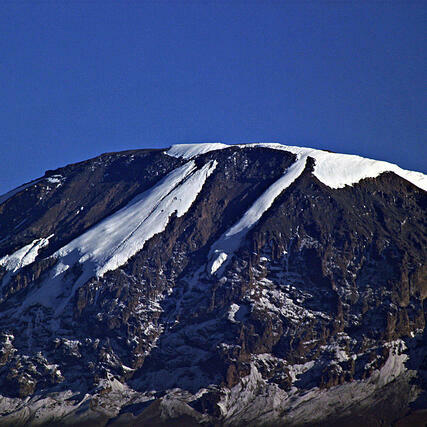 Kilimanjaro in Tanzania and Mount Kenya in Kenya, are both covered with a layer of snow and ice year round. Not up for mountain climbing? No worries. There are other options for snowball fights here in Africa. Snow falls regularly in parts of Morocco, South Africa, and Lesotho and all three of these countries offer slopes for skiers to slalom and snowboarders to catch some big air. So, the next time you visit Africa, bundle up! With thanks to Mackenzie Jones for this text, from the KU Center for East Asian Studies, this is Randi Hacker. Wish you were here. "Mount Kilimanjaro: Kibo Peak" Image courtesy of Pius Mahimbi. Released under a CC BY-SA 2.0 license.